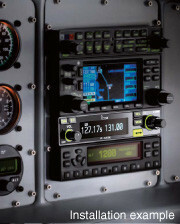 The IC-A210E is a panel mount transceiver that succeeds the IC-A200 which was a popular fit in ground support vehicles in the aviation industry. This ground to air transceiver has the capability to work on both 8.33 kHz and 25 kHz channel spacing frequencies. It features a modern OLED (Organic Light Emitting Diode) display offering many advantages in brightness, vividness, high contrast, wide viewing angle and response time compared to a conventional display. In addition, the auto dimmer function adjusts the display for optimum brightness either during the day or night. In addition to the widely used 25 kHz channel spacing, IC-A210E is also compatible with 8.33 kHz channel spacing. With this dual compatibility there is an increase in the number of channels available. The IC-A210E has an organic light emitting diode (OLED) display. The OLED display emits light by itself and the display offers many advantages in brightness, vividness, high contrast, wide viewing angle and response time compared to a conventional display. In addition, the auto dimmer function adjusts the display for optimum brightness at day or night. Selecting memory channels in the IC-A210E is fast, easy and efficient. The “flip-flop” arrow button switches between main and stand-by channels. The dualwatch function allows you to monitor two channels simultaneously. In addition, the history memory stores the last 10 channels used and allows you to recall those channels easily. The built-in DC-DC converter accepts a 12/24V DC power source. The IC-A210E can be easily installed and adapted to most vehicles. The IC-A210E is the same size as Icom’s previous panel mount, IC-A200. This means it can be interchanged with most predecessor radios now ending their life. Two types of rear-panel adapters are included, allowing you to replace it without soldering.